Discussion in 'General Discussion' started by AJAnon, Jul 12, 2016. Hello, some of you may know I'm a new member here. Within the past couple weeks I was pulled over in the US while heading to the store. I was given a warning for a broken tail light and a ticket for something else. The officer immediately stated that my tail light was out as being his reason for pulling me over. I did have some problems in the past with a tail light being burnt out, however being mechanically inclined I did fix this issue. There is currently no shorting or lose plugs that would result in a failing tail light. So, no problem right? Wrong. Due to pulling me over for a tail light, the officer discovered I was in violation of something else in which he wouldn't have known without pulling me over. My question is simple; how can I prevent being pulled over in the future? Is there any way I'm legally able to refuse an officer access to my license or searching my vehicle? I'm currently looking for a detailed guide to defending my rights as a law-abiding citizen. I know this might be a noobie thing to ask, but if anybody could direct me to such information, I'd be very appreciative. Thanks! No, there are no immediate reasons which would result in me being negatively profiled or categorized. 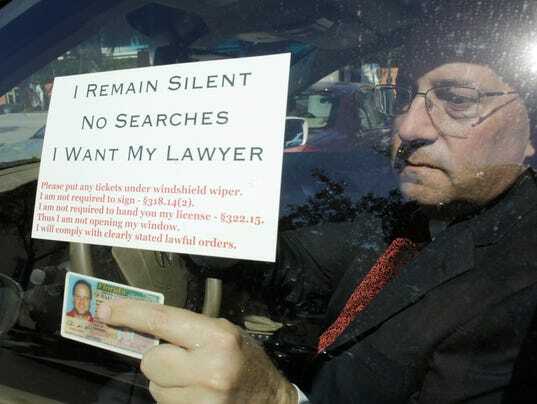 Google "my rights during a traffic stop" and add the name of the state where you live to get specifics. You have to provide your license, registration, and insurance, and basically nothing else. You don't have to answer any other questions or divulge any other information. Comply with reasonable requests, like turning off your music or putting out your cigarette. Also, if applicable, tell them if you have a firearm and where it is, and provide any concealed permit or other permit for it that you might have. Presumably, since this guy is holding a Florida Driver License, the statutes that are quoted are Florida state laws. You want to find out the same for your own state.